(Francisco Kjolseth | The Salt Lake Tribune) Drivers line up at Costco in Salt Lake City to fill up their tanks with some of the cheapest gas prices around on Friday, Jan. 23, 2015. 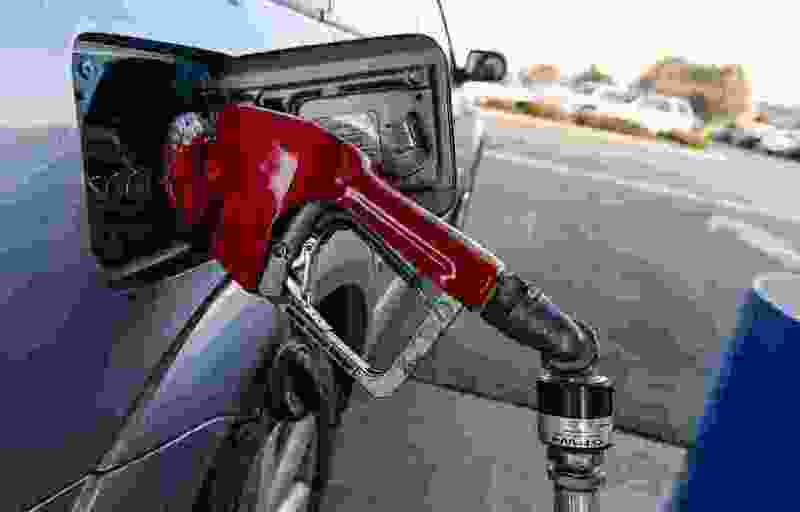 A ballot question asking voters whether the state’s gas tax should be increased by 10 cents — which would free up more funds for education — has gained support in recent months, but it appears poised to fall short, according to a new poll that comes less than a month before Election Day. The nonbinding question, which is part of a comprise approved by Utah lawmakers in March, is opposed by 51 percent of registered voters in the state; 45 percent indicated support for the proposed increase. Those backing the plan say its approval will come down to residents returning their ballots or showing up at the polls. “We're gaining momentum, and it will be critical for our supporters to get out and vote,” said Austin Cox, spokesman for Our Schools Now, which has championed the proposal. The Salt Lake Tribune-Hinckley Institute of Politics poll shows support up slightly from 42 percent in June and opposition down from 56 percent. The new poll shows 3 percent remain unsure of how they lean. Our Schools Now initially pushed a ballot initiative that sought to boost education funding by $700 million through income and sales tax increases. In March, the group agreed to set that aside in a deal with the Legislature where, in exchange, lawmakers passed a property-tax bill that allocated $200 million for education. The remaining piece of the compromise, the gas tax, could net an additional $100 million or more — and legislators have promised to enact it if voters indicate majority support on the nonbinding question. Still, it’s a bit of a three-step dance — the tax revenue, if raised, would replace general fund dollars currently used for transportation; that would make a corresponding amount available for education. All of that could be confusing to voters, believes Michael Melendez, policy director for the Libertas Institute, a libertarian-leaning Utah think tank. It’s also a challenge to convince Utah voters, Melendez added, which are overwhelming Republican, to vote for a tax hike. And high gas prices aren’t helping. The anti-tax Americans for Prosperity chapter in Utah, which has been the primary opponent to the ballot question, adds that the state’s gas taxes are already higher than the national average. And the group believes taxpayers here would rather see the state reprioritize the money it already has. “They’ve been taxed enough. They don’t want another tax increase,” said director Heather Williamson. Jason Perry, director of the Hinckley Institute of Politics, calls conservative voters’ aversion to taxes possibly the single biggest challenge Our Schools Now faces. And it shows in the poll: 39 percent of Republicans supported the question, compared to 70 percent of Democrats. Still, the number of supporters has increased since Our Schools Now started campaigning and talking to voters this summer, so Perry believes that once people are familiar with the question, they’ll be more likely to vote for it. Republican support, for instance, increased roughly 6 percentage points since the June poll. The survey, conducted Oct. 3 to 9, has a sample size of 607 registered Utah voters and a margin of error of plus or minus 4 percentage points. Among respondents, support tended to increase with education levels. Forty percent of those who reported having an associate or technical degree were in favor; 46 percent of those with a bachelor’s degree and 56 percent of those with a graduate or other professional degree. Utah Gov. Gary Herbert, the Alliance for a Better Utah and the Utah Education Association, the largest teachers’ union in the state, have all backed the question. UEA President Heidi Matthews appreciates that the money freed up by the compromise, if passed, would support individual schools and classrooms. It cannot be used on administration, according to a draft of the bill, or for construction. Matthews would like to see at least some of it spent to boost teacher salaries, which she hopes might improve retention rates in the state during a somewhat dire educator shortage. In Utah, 47 percent of new teachers leave the profession after five years in the classroom, according to a joint study from the Utah State Board of Education and the Utah Education Policy Center.